It was just last quarter when GetApp, the leading business app discovery platform gave us a reason to celebrate by featuring CakeHR in the top 10 software solution list. Come Q3 and our happiness is twofold. 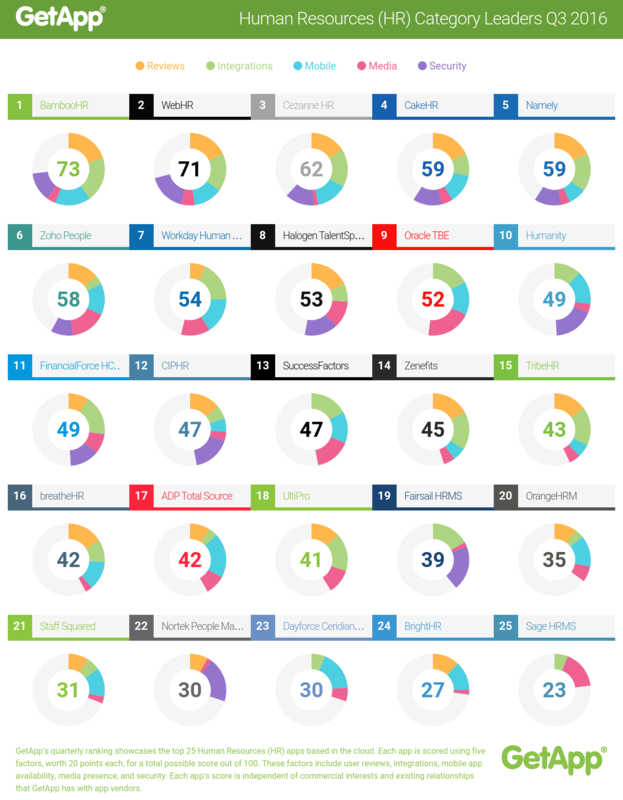 A quick revisit of 5 data points used by GetApp to rank the different apps tells us our progress on each of these parameters as well as the overall score. We jumped 5 points on the total score from 54 to 59 that helped us catapult from rank no. 6 to rank no. 4. We also scored extremely high on the parameter of “User Reviews” that goes on to show the extent of faith our customers place on the CakeHR software. Each of these 5 data points is scored out of 20. In case of tie, each data point is weighted for importance, with security taking precedent, followed by reviews, integrations, mobile apps, and media presence, respectively. What does this ranking mean for our existing and future customers? Rejoice! You have chosen well. CakeHR would continue to offer the best of its service in terms of online leave management. We would make sure to please you with new features and updates that can let you manage employee time-offs like never before. With our high security and fully integrated solution, you can continue to be at the top of your game from anywhere and anytime. Congratulations! You have discovered the right place. CakeHR is the ideal choice for small to medium organizations and start-ups that want to digitize and automate their employee time-off and leave management process. After all, everybody needs to break up with spreadsheets and paperwork. Considering the above 5 factors used by GetApp, here is how CakeHR makes the lives of its customers easier and simpler. We have been very consistent when it comes to user rating and feedback. Our customers admire the personal touch and flexibility to customize that comes with our software. You can add personalized tables and fields suited to your organization and generate detailed employee and company reports with respect to organization chart, leave and time-off. With us you not only stay ahead of the technology curve but also reduce management challenges by graduating from paper and excel sheets. 24*7 mail and phone support along with a free 30-day trial makes us very accessible and affordable to our customers. You can always be aware of who is off and when, thanks to our seamless integration with Google Apps and other platforms like Slack. Your employee data is regularly synced with MS Outlook, Google Calendar and Apple iCal – allowing real time sharing of information with geographically scattered work base. CakeHR works wonderfully on any device – be it mobile, tablet or desktop. We have a full-fledged app for Android and iOS users with sleek interface and quick navigation, aiding our customers to manage HR on the go. We are moving ahead gradually but surely in the direction of taking CakeHR to more and more online users with our social media presence. Our Twitter, Facebook, LinkedIn and SlideShare pages apart from sharing cool stuff related to our product, share valuable insights and trends affecting the HR tech industry that has earned us loyal base of online followers. Our blog feed has featured in the list of best HR blogs to follow with its fresh and unique approach in exploring and describing HR tech trends. CakeHR employs high security standards to protect the online data and records by making it available only through role based access controls and strong password policies. Our software facilitates data backup in multiple geo-locations with support for audit logs, encryption and security alerts. What this ranking means to CakeHR? Everyone likes to be appreciated and recognized for job well done. We are no different. Featuring on the Top 5 HR Software list gives us motivation to outperform ourselves quarter on quarter by delivering superlative product that assists our customers to save time and money by giving their employees the power of CakeHR.